Hot sauce (or chili sauce) is a condiment made and widely used throughout the Caribbean. 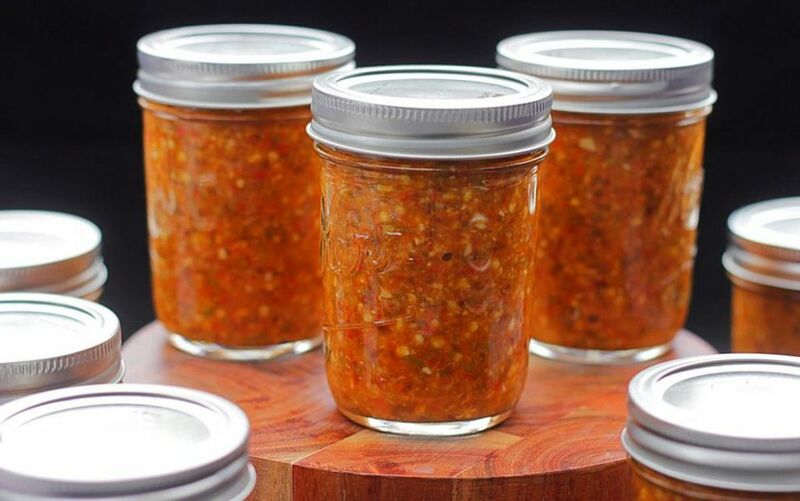 Each island and household has its own recipes and you can always find a bottle of homemade pepper sauce in most homes. Don't be surprised if your host or hostess asks you if you would like to have some pepper sauce with your meal. Warning: If you're allergic or sensitive to hot peppers, wear gloves when handling the peppers. When making large batches of the sauce, you must wear gloves or else you'll feel the burn later. Be careful not to touch your hands to your eyes after handling the peppers. Put all the ingredients in a food processor and pulse until the peppers are minced finely. Scrape down the sides of the bowl from time to time. Once the peppers are chopped pretty finely, let the processor keep whirling and pour just enough of the vinegar through the chute to moisten the peppers and give it the consistency of a thick sauce. Pour the hot sauce into sterilized glass bottles or jars and cover with airtight lids. Store the finished product in a cool place or in your refrigerator until the flavors meld together nicely. Or, you can place your bottles of pepper sauce in the sun for 2-3 days to ripen quickly and then store in a cool place. If there's no sun where you are, let the pepper sauce cure for at least 5 days before use so that the flavors can develop. Substitute oil for the vinegar to further intensify the peppers' heat.